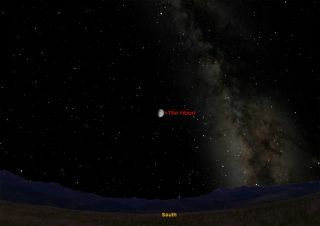 This sky map shows where the moon will appear on Sept. 18, 2010, the first International Observe the Moon Night, as seen from the eastern U.S. This weekend brings the first global moon-watching eventinspired by those who are curious about the moon, but there are some easytricks that skywatchers may want to remember to make the most of thelunar-gazing experience. More than 278 moon-watching events in 40 countries areplanned for the InternationalObserve the Moon Night event on Saturday (Sept. 18), and it's not hard to seewhy. The ever-changing moon was one object in the celestial scene thatattracted my attention skyward as a young boy, with its varying phases, timesof rising and setting, and other, more subtle aspects of its visibility that Istill find fun to watch. This weekendsky map shows where to look for the moon on Saturday. With a photograph orlunar map as a guide, you can easily study the moon and identify a number ofits most prominent features. Through binoculars or a small telescope, we can see thatthe moon?s surface has mountains, plains, and large hollows with ridges aroundthem called craters. The plains, which form the dark patches, were oncethought to be oceans and seas, and were given poetic names like the Sea ofSerenity and the Bay of Rainbows. These names are still used, although we nowknow that these dark areas are flat plains of lava and that there is no flowingliquid wateron the moon. Water does exist on the moon in substantial amounts in theform of ice and its chemical components. Astronomy neophytes are pleasantlysurprised the first time they look at sky objects with a pair of binoculars.But in reality, most amateur and professional astronomers regard binoculars asstandard viewing equipment. Binoculars are the ideal starter instrument becausethey?re so simple to use. Through them, you can see the image right side up andin front of you. The large field of view makes it easy to find what you pointat. The moon isin fine position for evening study. Nearly allof the major lunar features can be seen. The moon isnot sufficiently bright to cause loss of detail through glare. As the lineof darkness ? called the terminator ? recedes, features near the border standout in bold relief; the shadows become stronger and details are more easilyseen. Your first glance through binoculars will reveal theso-called seas or maria (plural of mare). Using a photograph orlunar map, spend a few nights outdoors identifying various lunar landmarks,they will soon become as familiar to you as the geography of the Earth. "Throughout these nights of discovery andexploration of the moon one question kept recurring to my mind. Why had Ibeen denied all this until my school years were so nearly spent? Why had it notbeen made a part of the growing up of every youth? I had been taught therivers, the seas, the mountains of every continent on earth. I knew thecapitals of every state and country in the world. And all this time,right above me, the 'geography' of a whole new world had been turning, page bynightly page, and no one had opened up the book for me." The mountains on the moon are easier to see through asmall telescope, particularly those that lie along the terminator. There, thelight comes from the side and the mountains cast long shadows, just as theywould here on Earth in the early morning or late afternoon. That's why brightlylit lunar peaks stand out and the moon appears more rugged. When I was a teenager, I used to imagine that I was anastronaut by viewing a gibbous moon at high power through my telescope; lettingit fill my entire field of view. I'd then put the moon just outside thefield of view of the eyepiece and allow it to majestically drift intoview. To enhance the effect, I'd listen to recordings of radiocommunications that were made during the various Apollo missions to the moon.The effect was dramatic, especially while I viewed craters and mountains, deepin shadow, slowly glide on by. Try it for yourself. In the nights that followed, and as the terminator movedon, the sun climbed higher in the sky over the region of the moon that I waswatching and the shadows grew shorter and shorter; the lofty lunar mountainsseemed to melt into the landscape and almost disappear. This is why a full moonappears flat and one-dimensional, because the sun is shining on it almostdirectly. On Saturday night, the moon will be 11 daysold. That is, it will be 11 days past new phase, four days past first quarterand 85 percent illuminated; an excellent phase and position for evening study.In binoculars or a telescope, about halfway from the center of the lunar diskto the terminator, you?ll readily see the crater Copernicus, christened the"Monarch of the Moon," by English lunar mapmaker Thomas GwynElger. Surrounding this crater is a ray system that resembles a giganticsplash pattern. But down near the moon?s lower limb is acrater with an even more outstanding system of rays: Tycho, one of the youngestof the major lunar craters. British astronomer the Rev. Thomas WilliamWebb poetically referred to Tycho as "the metropolitan crater of themoon." Its brilliant rays extend outward like a sunflower in alldirections for many hundreds of miles. Webb claimed that it?s evenvisible to the naked eye at full moon, something you might like to test foryourself if you have good eyesight. In his book "Exploring the Moonthrough Binoculars" (McGraw-Hill, 1969), Ernest H. Cherrington, Jr. saysthat Tycho?s rays "... give the full moon the general appearance of apeeled orange, the crater marking the point where the sections meet." Observing the region near and along theterminator will reveal a host of other fascinating lunar features. And with theunaided eye we can imagine one eye of the "man in themoon" watching us; in the nights to come, the other eye will appear,and the mouth and nose, too, as the lopsided appearance of what we call thegibbous phase fills out ultimately to become the full moon. So keep all these things in mind when yougaze up at Saturday night's moon. After all, it's not just for werewolvesand lovers!